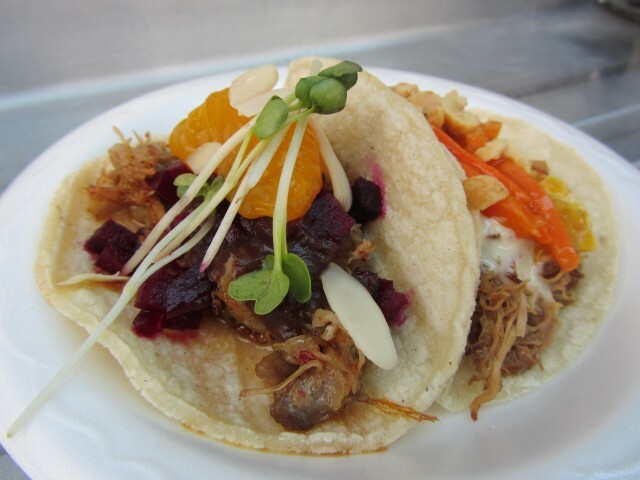 The Flying Pig’s Tamarind Duck taco. The duck confit was delicious, with beets, radish sprouts, and the surprising brightness of a tiny tangerine slice. But the smoked chicken was unbelievable. The mango slaw and green curry aioli were a bit much, but the chicken itself was so flavorful, and the crunch of peanuts worked well. The Nomad Truck’s Za-atar chips were like pita chips encrusted with sesame seeds and sumac. The pucker of the sumac along with the tang of the yogurt dip made for an exciting experience, you know, as exciting as a snack can get.